The cost to attend college can be daunting. Tuition, housing and utilities add up quickly, and the cost of textbooks is one expense that continues to grow at an alarming rate. Open Education Week, which will be celebrated from March 5 through 9, is a global movement that is picking up traction. With a goal to share resources, tools, and practices to improve worldwide educational access and effectiveness, open education is combining the tradition of faculty-directed learning with 21st century technology. Recognizing that traditional methods and high-priced textbooks pose a significant barrier for student success, Southern Utah University is working to make education more affordable and accessible. Through the university’s commitment to tackle this problem, SUU has hired one of the state’s first Open Education Resource (OER) librarians, Rosalyn Liljenquist, to promote and expand the use of open education resources and serve as an OER curator. OER materials include any type of educational materials that exist in the public domain or have been released under an open license that allows them to be used and redistributed with no access costs. In order to pursue the university's goals of building a repository of quality open resources, Liljenquist assists professors as they adopt materials that are tailored to their needs. To meet deficiencies in the available materials, faculty members like Roger Gold, associate professor of biology at SUU, have found innovative ways to create OER materials and offer unique educational opportunities to students. Inspired by an OER workshop he attended, Gold had a small group of students create its own open resource materials during his microbiology summer course. Gold split students into groups and had every group construct an informational website. His goal was to give students an opportunity to gain valuable experience with real-world applications and a deeper understanding of the concepts of microbiology. Rico was one of Gold’s students and said she felt that creating OERs was more engaging than sitting in a class where a professor is merely reading slides. “Overall, it helped me a lot, and it changed my view on microbiology,” said Rico. Inspired by the success of his students this past summer, Gold plans to keep the student-created “wiki” for his other students to use as a study guide. He also taught two biology courses this fall and while he taught one using his traditional lecture and textbook, the other mirrored his summer course where students created their own OER materials. He will now review and compare the performance of both groups. Liljenquist will compile similar data for the university as it examines the effectiveness of OER in a unique multi-year, cross-curriculum study. Textbooks play a big part in the cost of higher education. Students pay on average $1,200 per year on books alone. Usually, the expense for books is met directly out-of-pocket, and not with scholarships or financial aid. The cost for textbooks has risen ninety percent in a period of eighteen years. The Consumer Price Index for textbooks has increased at a higher rate than that of new home prices and medical care. The high cost of these books has forced many students to reconsider purchasing the materials, even if it meant that going without the textbook could hurt their grades. In a recent episode of Solutions for Higher Education with President Wyatt, Saunders discussed the cost of textbooks and how OER can be the solution to these high prices. Dr. Andrew Misseldine, assistant professor of mathematics at SUU, published a case study comparing students who used OER for their textbooks with students who used traditional textbooks. The case study found that both groups did well academically, but the class that used an OER textbook had fewer students drop the course. 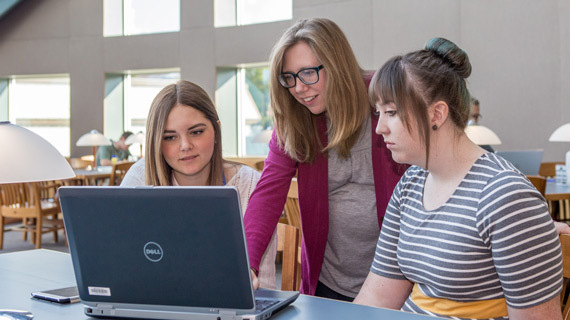 As students and faculty see the benefits of OER, SUU will continue to redesign and rethink its approach to education in order to meet their mutual and distinctive needs. And for their part, SUU students are thankful for the adoption of OER usage and are looking forward to a wider application on campus. Liljenquist says her door is always open and she is ready to help faculty adopt and adapt these resources. She can also be reached at the Sherratt Library and through her email address at rosieliljenquist@suu.edu.